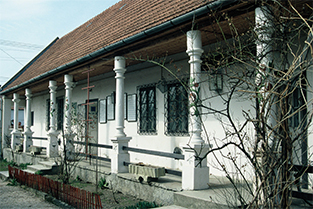 Zsámbék was first settled in the 12th century, but only had two remaining taxable houses at the end of the 17th century. Lord Zicky thus first settled Hungarian, but after 1800 also Swabian, Franconian and Austrian colonists in the village. In the course of the centuries, the settlement turned into an almost exclusively German village. The Hungarian residents assimilated so that their names became the only signs of their origin. On April 5th 1946, 3.397 people were displaced from the Zsámbék region, which had had only 5.000 residents in total. Most of them came to Gerlingen in Württemberg, a smaller number to the Hessian Wettenberg. 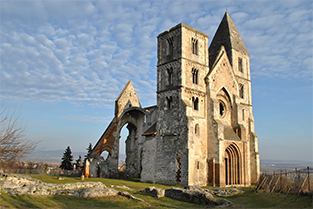 The church ruin, the symbol of Zsámbék is the fragment of a Prémontré basilica with three naves and a monastery. The church in late-romanic and early-gothic style was built between 1220 and 1234 and destroyed in an earthquake in 1763. The ruin was preserved in 1900 and its interior can be visited. In one of the monastery’s rooms holds a lapedarium. The house of Melchior Keller’s family from the early 18th century was saved just before demolition in the 1980s. A relief on its gable wall shows Saint Wendelin, patron of all shepherds. The building was equipped with a traditional Swabian parlour and kitchen and refurbished furniture showing 16th century furniture decorations from the Black Forest. The patterns were still used by Zsámbék carpenters in their original quality. In the course of the 1960s, Ferenc Boros built a collection of “lighting items” and many Hungarian filmmakers have used part of this fundus in the 1970s. Using the rental fees, Boros was able to enlarge his collection. 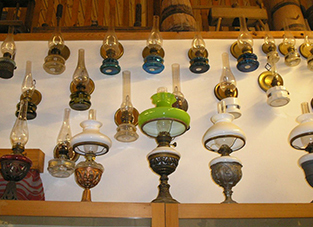 At the moment, the country’s only lamp museum holds over a thousand objects. In 1995, the museum entered the Guinness World Records. 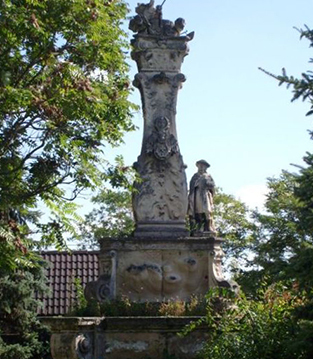 The plague column was erected by Miklós Zichy in 1739 to commemorate the victims of the plague in Zsámbék. Half of the population died in the epidemic, many of them recent settlers from the German regions. It was the first plague column in Hungary. The Zichy’s family crest can be found on the middle of the baroque column with a statue of Saint Roch. 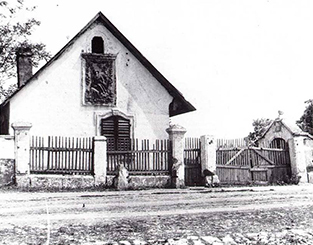 After the plague new settlers from Franconia came to Zsámbék and built a new lane through the village. They used clay for building their houses and thus a clay pit (called “Lahmgrubm” in the local dialect) was established. To the sides of the pit, cellars were built. Of the 70 of these cellars, in front of which people used to drink wine and chat, 25 remain until today. Ruin of late-romanic, early-gothic Prémontrée Basilica built 1220-34. Saint Wendelin House (today local history museum), early 1900s. The exhibition can be visited upon previous notice. Opening hours: daily 10 am -4 pm , closed on Monday.